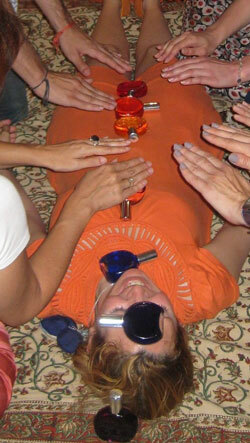 We offer Colour Therapy and Readings for spiritual and personal transformation as well as courses. Colour Therapy is very useful to release blocks and emotions held in our bodies related to traumatic memories and past lives. It also will help you in feeling calm and balanced. In our sessions of Colour Therapy we can use different methods of working with colour: chakra balancing, colour breathing, colour meditations, colour past-life regressions and colour visualizations. Aquarian Colour use as well Colour Therapy to enhance or amplify other therapies, including Reiki, Reflexology, Counselling, EFT, Kinesiology, Theta Healing and Coaching. Sessions can be presential or by distance (via skype or phone). Mini Consultations - We offer advice on a bottle suited to your needs. Colour Readings - The client choose bottles and place them in a pattern or shape and then a colour reading will take place. Ascension Readings - Through the Star of David. It helps to discern which things he had to work in the past, at the present moment and in the near future. Colour and Numerology Soul Reading - Through your birth numbers, name and colour, we will orientate you about your purpose life and how to get there. Chakra Readings - Dosing the different parts of your body and through colour bottles we will pinpoint stuck issues & potential. Dynamic Readings - The client pick a bottle each time the therapist asks him a question.It is as well such a healing in itself!